This hiking trip was possible because I was in Rome already, rendezvousing with family members, to see Pompeii and the Amalfi Coast. That trip was interesting, but it left me tired and hot. While everyone else was returning home, I boarded the train for Innsbruck. 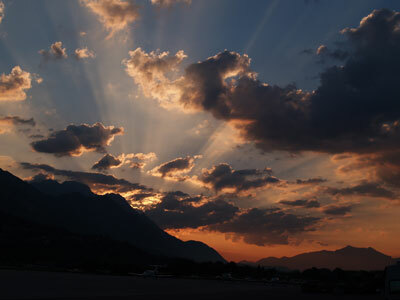 After an arduous journey, including two changes of train, I finally arrived in Innsbruck after dark, and in the rain. 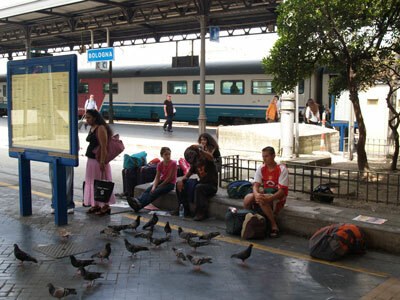 I had booked a place at a hotel/hostel, which claimed to be close to the train station. Actually it was a twenty minute walk. And I was unsure of how to get there, so it actually took me more like an hour. It was an ordeal, in the rain, and lugging my pack as well as my luggage. Finally I found the place, which was actually quite satisfactory, but I was beat and went right to sleep. I walked into town and made a visit to the Hiking Society offices, to get maps and information. I carried my backpack, in hopes that I would not have to return to the hotel. 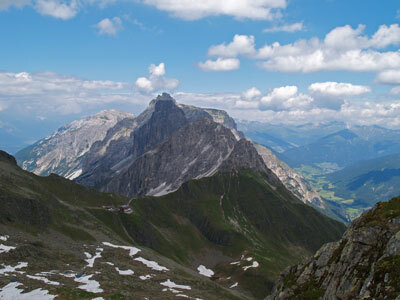 Because I was so tired already, I had decided to be less ambitious, and hike in Karwendel again. But the snow still blocked some critical passes in Karwendel, meaning I would have to stick to the valleys. In the Stubai, there were a couple of places on the hut route that were similarly blocked, but with the help of the advisor, I picked out a portion that was likely passable. I would still need my crampons and axe, so I walked back to the hotel, retrieved my equipment, and went to the train station to wait for the bus. The bus ride to the Stubai valley was scenic. We passed through each of the little towns in the valley before getting to the trailhead, at the next to last stop. Near the beginning of the trail there was a big pile of hiking poles, by a sign that I could not decode. Apparently they are for hikers to borrow and return. 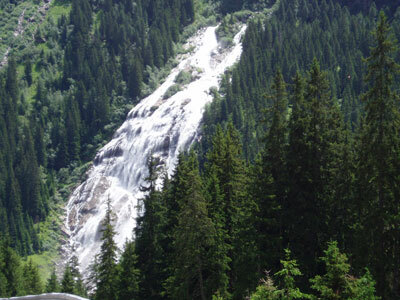 The trail led steeply up the valley wall, beside a roaring cascade. The weather was sunny, but the ground was still wet from last night's rain. 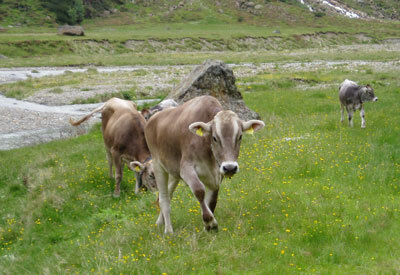 In a little over an hour I came to a big meadow and Sulzaualm. I don't know if the land is public or private, but there seem to be sheep and cattle in all the meadows, right up to the snow line. Their bells produce a clanging that can be heard for great distances. They are often interested in people, and came right up to me. The alm offered a full menu of lunch food and drink, served in a rustic outdoor patio with rustic picnic tables. There were about 20 people enjoying the sunshine, the beer, and little sausages. I had a large Fanta, ate some of my lunch, and pushed on. The trail switchbacked up another 1000 feet to Sulzenauhutte. 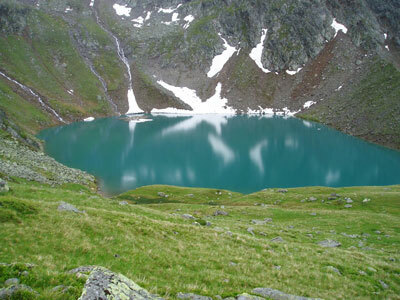 It started to rain, lightly at first, then harder, but it did not take more than an hour to reach the hut. Soon the sun came out again, and everyone emerged from the hut. Some played cards and admired the scenery, but two groups put on climbing equipment and started practicing mountaineering techniques. Part of this involved hanging by a rope from a frame, as if they had fallen into a crevasse. Each person had to use their equipment to get up their rope. Another group was practicing rope techniques for glacier walking. Apparently these groups were heading for Wilder Freiger, a prominent local mountaineering destination. 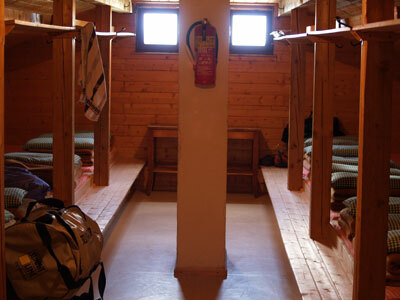 I decided to stay in the matrazenlager (dormitory) instead of an individual bedroom on this trip, just to see what it is like. Here and at all the other places, the sleeping arrangments were quite comfortable. 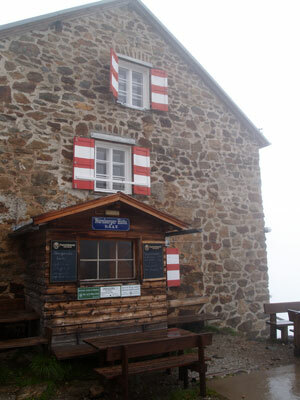 In Sulzenauhutte, the lager is on the top floor. There was room for about 30 people, and only five occupants. Everyone was very quiet and respectful. I got to sleep right away and had a very restful night. 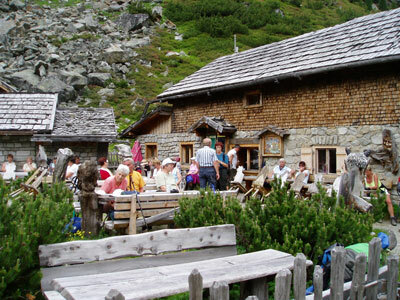 Sulzenauhutte is a convenient base camp for the high peaks such as Wilder Freiger. Shortly beyond the hut the glacier starts. It looks a little ominous, hanging threateningly above. 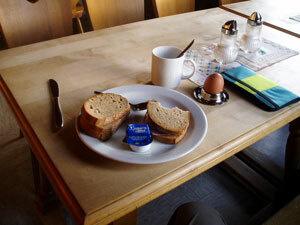 After a big breakfast, I got away as early as possible, since rainy weather was predicted for later in the day. It started out very overcast, with the tops of the peaks hidden by clouds, and got progressively cloudier. Before long, the clouds turned to rain, light at first and then heavier. I got out all my rain gear, although this simply made me wet from the inside rather than from the outside. The trail climbed up and down over a series of side canyons, then headed up a moraine, past several charming lakes, toward a ridge and a very steep headwall. I stopped by the lakes briefly, but the threatening weather made me hurry along. 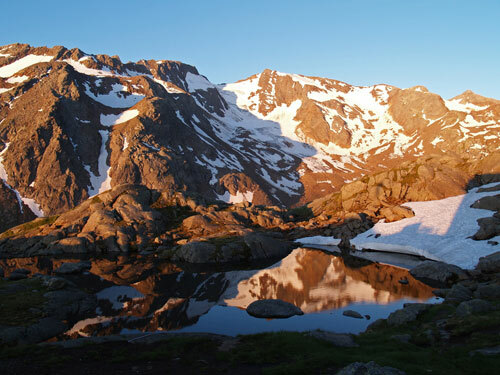 The trail offers two choices: one short and steep, and another longer and less steep. I think the longer way also has a better view, but since I was in the rain by this time, and visibility was essentially zero, I opted for the short way. The ridge itself looked utterly impassible, but when I got there I discovered very nice switchbacks all the way to the top. 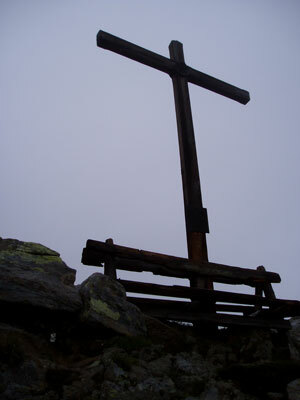 At the pass there is a cross and a bench. I did not stop to rest, but hurried on down the other side. The descent was amazing: unimaginably steep, with cables most of the way. From the bench at the top, the hut is almost straight down -- all you can see is the roof. 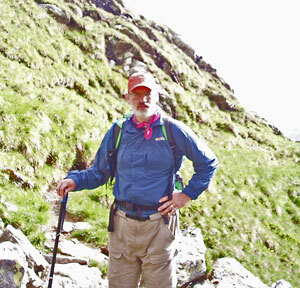 I picked my way down the slippery rocks, eventually arriving at Nurnberger Hutte. The "par" time is three hours, and that is about what it took me, so I was there before lunch. I might have been tempted to push on, but it was warm and dry inside, cold and wet outside. Instead I got acquainted with the drying room, hanging up all my clothing. I had a little lunch, took a nap, then headed back to the dining room as other parties started arrriving. There was a mountaineering party, who had apparently come down from much higher on the mountain. 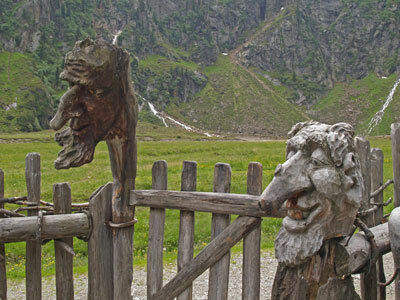 There was also an Engligh couple, who had come from Sulzenau Hut behind me. This time I got a lager room that housed 10, but no one else was in it. I even had a bathroom pretty much all to myself. The hut was run by a couple who had two young children, who were very well behaved. I chatted and compared notes with the English couple, who were headed the same way. 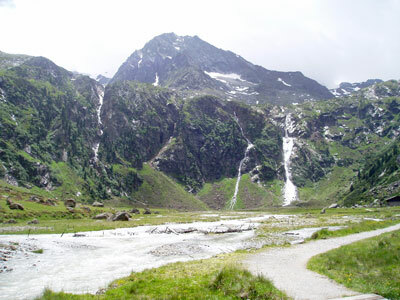 They had hiked part of the other side of the valley, but had been warned about the ice, and so had descended and then gone up to Dresdner Hutte on the gondola lift. From there, there, they came to Sulzenauhutte. We were both a little concerned by the snow on tomorrow's route, but the hut log book showed people coming and going on that route, so that was good news. I again got an early start: the time to the next hut was four hours away. The sky was clear, with clouds moving up and over the ridges now and then. The trail started by going up, then down into each canyon, and up again. Each stream was filled with rushing water, but each one has makeshift plank crossings. 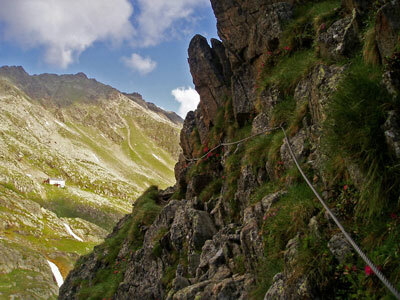 The trail climbed higher and higher, with many sections of cable, as it approached the Simmingjochl Pass. The trail crossed the first significant sections of snow, some of them very steep. I crossed these carefully with the aid of my axe. . It was lunch time, so I rested, took pictures, and had a little to eat. 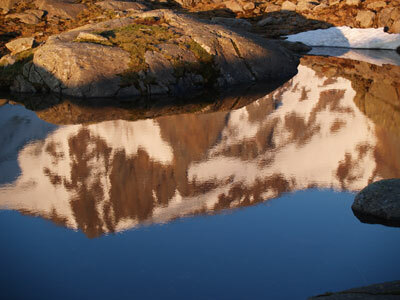 I took a little side trail along the ridge to a small lake and the foot of a glacier. 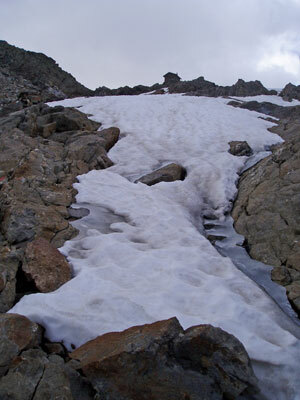 The glacier itself was much different from a typical snow field: much more like solid ice than compacted snow, and full of embedded rocks, gravel, and other debris. I did not seriously try to climb on it, but it looked very slippery. Everything around was scoured and raw looking. 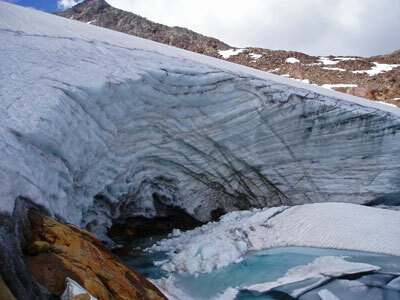 A huge section (50 feet high) of the end of the glacier had collpased into the lake, and there was a big flow of water beneath it. I was looking for the English couple to catch up with me, but there was no sign of them when I arrived back at the pass so I proceeded on. Bremer Hut was a short way beyond the pass. Again it was run by a couple with small children. They had just completed a brand new wing, containing the sleeping quarters, which was very luxurious. It all smelled like frech lumber, and was really nice. I had to share the room with a couple other hikers, but again it was mostly empty. After a day of clouds mostly hiding the hiding the higher elevations, the evening brought clear skies and a spectacular sunset. The hut is set in a gorgeous meadow, with little lakes around it. Up above, the mountains are mostly snow covered and impressively steep in all directions. To the south is the border with Italy. The English couple finally arrived, having take 8 hours to make the trip from the last hut. They did not look especially tired, or like they were having trouble, but they were traveling pretty slowly. Tomorrow's hike is rated at 6-7 hours, so we were both planning a very early getaway. 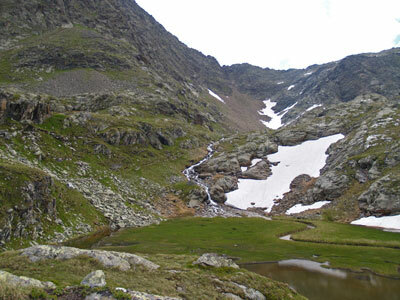 The route to the next hut is the most challenging of all: it travels high up along a ridge, crossing two passes on side spurs. I got up as early as possible, had a quick breakfast, and got on the trail as early as I could. The early morning light was magical. The sky was completely clear, the winds calm. A perfect day coming up. The whole way is either steeply up, or steeply down, but the starting and ending elevations are about the same. The trail starts with a choice: contour around the slope to Lauteresee (a lake), or descend below the lake and then climb back up to meet the trail. The route by Lauteresee is half an hour extra, but I wanted to see the lake. 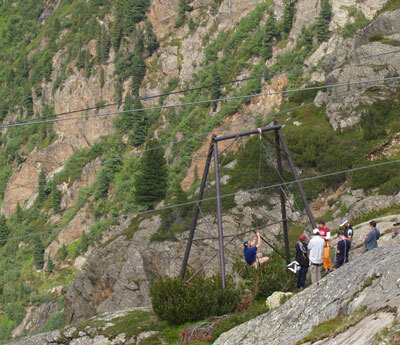 It turns out that most the route to the lake is on steep cliffs, with fixed cables. Still, the lake was worth a visit. I continued along the trail, through grassy meadows where sheep were grazing. After two hours I passed a milestone, exactly on time. I felt good that I was finally getting into the rhythm, cruising along quickly and easily. 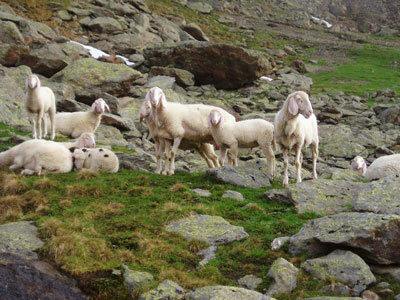 I was admiring the sheep, the views of the Italian border, and the crystal clear skies. As I was passing through a hanging meadow, I stepped on a rock which rolled out from under my foot, twisted around, and sprained my ankle. I heard a couple of loud pops coming from my left leg. With the aid of my ice axe, I was still able to kind of limp along at a very slow pace. I thought I better not stop -- it might stiffen up and get worse with time, so I should keep moving and try to get as far as possible. I knew there were people following me, althugh the English couple had decided to go back to Nurenberger Hut. The ankle was very painful, especially to twisting or bending, and had very little strength. But with the aid of my axe, I could move along slowly. Climbing was actually easier than descending, although there was plenty of both. If it were not for the pain and uncertainty, the route would have been marvelous. The scenery was amazing, the wether perfect. The steepness of the trail was absurd -- it seemed that for hours the trail traveled along narrrow ledges above cliffs hundreds of feet high. 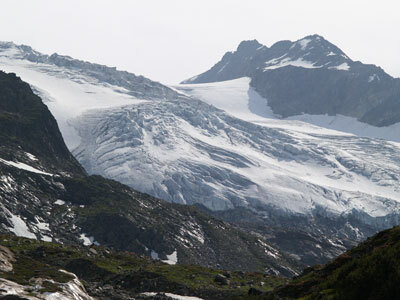 It went steeply up, then steeply down, across rocky avalanche fields, then up cable-protected cracks, across steep snow fields, then down talus slopes. The whole time, the canyon below was dropping farther and farther away; the dinging of the cows and sheep growing ever more distant. A few parties coming the other way passed by, and I kept expecting to be passed up by the parties behind me. Every time I stopped for even a few minutes, the ankle did not work as well, so I nibbled on snacks and kept on moving. at the rate I was progressing, I figured that I could cover the remaining four hours distance in eight hours. This would still get me in by six PM, well before dark and even in time for dinner. 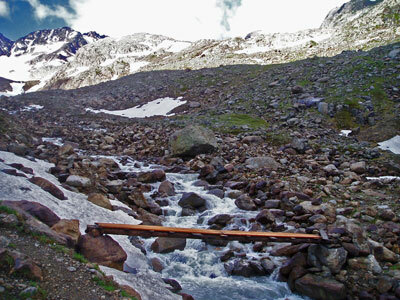 When I crossed the last main pass, and could see Innsbruker Hut, the sighs said 30 minutes remaining. I was relieved to see it was all downhill. Still, it took me another 90 minutes to arrive at the hut. Every muscle was stiff and aching -- not just the ankle. I climbed up to my room on the second floor (two flights up) determined to only make the ascent twice. I changed to dry clothes, returned downstairs to hang them in the drying room, and sat where I could prop my foot up. This was Saturday night, and there were more people here than at the other huts. I was joined at my table by a party of local climbers, one of who knew some English. We had a little bit of conversation, but when I finished my dinner I want straight up to bed. I think they thought I was a bit unfriendly. I wish I could go back and visit with them some more. I slept remarkably well that night, but every time I woke up I went over and over what I would do next. There were various ways of getting back, and I bounced from favoring one, then another. I woke up at about 3:00 and realized that a different plan would work best, and then I felt more relaxed. I work at 4:00 and went to the bathroom, where I was shocked to see how red by whole foot was (I could tell how swolen it was). By lying ther for 12 hours, I actually got a good nights sleep of 8 hours. The next morning I conferred with the hut staff and confirmed my choice of trail: by descending to Pinnisalm I could catch a taxi to Neustift and the bus. By the signs, this was only one hour on the trail and 30 minutes on a road. Best of all, I could see the whole route from the hut, and it die not look too bad. The last task before leaving was to put on my boots. I loosened the laces as far as they would go, but the boot slipped on without a problem. Another step closer to home. Again, my progress was slow -- it took me four hours in all to get to Pinnisalm. But the people there were kind enough to call a taxi (which they call jeep), which was already on its way with some hikers. Because of this, I think I got a real bargain on my trip. It took me irectly to the bus stop in Neustift. I had to wait 90 minutes in the boiling sun, because it was Sunday and the busses ran only half as frequently as usual. I watched people arriving at the park across the road to sit in the sun on the grass, grill sausages on grils, and just enjoy the day. I could see para-gliders (?) descending from high up the ridge, at the top of a gondola lift. They seemed to be catching updrafts, because I saw the same person rise and descend several times. They seemed to stay aloft between 30 minutes and an hour, and finally descended to land in pastures nearby. When I saw one on the ground, folding up his parachute, I finally realized what those humongous "backpacks" were. On the way back to Innsbruck, the bus stopped at a village that was having a traditional music festival. There were many marching bands, dressed in traditional Tyrolian garb, taking turns playing for the crowds. I had seen flyers in Innsbruck for this annual event. If I weren't anxious about my ankle, I would have gotten off and caught the next bus back to town. As it was, I just wanted to get back.